1. Why should I choose Luxury Spray Tan? Our team at Luxury Spray Tan likes perfection. All of our Luxury Spray Tan techs have had hands on training from Norvell University and are Master Certified Sunless Experts. We go out of our way to make sure you achieve the very best and natural looking spray tan – each and every time. We consult with our clients on the desired color of your spray tan and take the time to make sure you receive the perfect spray tan. Having a free spray tan membership with Luxury Spray Tan will speed up this process and provide you with other benefits including free spray tanning sessions. We use a beautifully scented almond and raspberry product that is natural and hydrating for your skin and provides you with the perfect color without the smell of a tanning bed! 2. How do Luxury Spray Tans work? Our Luxury Spray Tan technicians use the award winning machine to spray the award winning sunless formula onto your skin. The active ingredient and coloring agent in the solution dihydroxyacetone (DHA) causes a chemical reaction with the amino acids on the outer most layer of the skin. This reaction causes the color of the skin to change, producing a beautiful natural tan. DHA starts to react with the skin within 2 hours of the Luxury Spray Tan application and continues to do so for a total of 8-12 hours. As your dead skin cells are sloughed off or worn away from the surface your tan begins to fade. 3. How many days will a Luxury Spray Tan last? The longevity of a sunless tan, in general, depends on the type of self tanning application, the skin’s natural exfoliation process, and on the skincare regimen followed application. On average, self-tanners last from 4-7 days. A professionally application such as a Luxury Mobile Spray Tan will last longer than an at-home application, as there is usually a greater percentage of DHA used. • At-home application (lotions, sprays, mousse, etc.) = 2 to 5 days • Professional Luxury Spray Tan application = 7 to 10 days The “life span” of a sunless tan also depends on your skin’s natural exfoliation. The faster your skin turns over, the faster the sunless tan will fade. The tan created by the DHA affects only the top layer of the skin and will begin to fade after 4 to 5 days as the skin naturally begins to exfoliate. Following a good regimen before and after your Luxury Spray Tan will help a sunless tan last longer. Exfoliating 12-24 hours prior to a sunless tanning session and keeping skin moisturized afterwards are essential. Sunless tan-extending products with a light self-tanning bronzer will help hydrate skin and maintain even, natural-looking color longer. 4. How long should I wait after my Luxury Spray Tan before I shower? It is best to wait about 8 hours after your Luxury Spray Tanning session before you bathe or shower to give the DHA time to fully react with the skin proteins. We recommend 12 hours and for best results wait 24 hours. We also offer an EXPRESS tan which allows you to rinse off within 1-3 hours later. 5. Why is keeping skin moisturized essential to maintain great results? It is important to keep skin moisturized after your Luxury Spray Tanning session as dry, flaky skin will slough off faster and color will fade sooner. You basically want to slow down your body’s natural exfoliation process. Luxury Sunless tan-extending with a light self-tanning bronzer will help hydrate skin and maintain even, natural-looking color longer by providing subtle bronzers. 6. Will my Luxury Spray Tan application come off on my clothes? As most of the Spray Tan solutions contains a cosmetic bronzer, some of the bronze color may rub off on clothing or bed sheets. This is most likely to happen when you get dressed immediately after your Luxury Mobile Spray Tanning session. To minimize the chance of the tint transferring to clothing, we recommend that you wear loose-fitting, darker clothes after your Luxury Spray Tanning session. Try to refrain from physical exertion that could result in you sweating until you shower and wash off the cosmetic bronzer. The cosmetic tint is water-soluble. Therefore, in most cases, the color will come out of clothing in the wash.
7. How long does my Luxury Spray Tan session take? Your custom Luxury Spray Tanning session will normally takes about 15 to 20 minutes. 8. Is Spray Tanning Safe? DHA (dihydroxyacetone) is all-natural and has been approved by the FDA for cosmetic use for over 30 years. Spray Tanning is the best and safest alternative to the dangers of sun exposure. The sunless tanning application is safe, effective and takes as little as 15-20 minutes from start to finish. The solution takes 8-12 hours to fully develop and your spray tan will darken during this time. 9. Can I still get a Luxury Spray Tan when I’m pregnant? There are no known side effects from the application but you should always consult with your physician before receiving a Luxury Spray Tan. Results on pregnant woman may differ due to the hormonal changes in the body. 10. Will I turn orange from my Luxury Spray Tan? In order to avoid this common problem, Luxury Spray Tan has tested most every solution on the market in order to find the most natural looking and long lasting tan. After lots of research and testing we have found an incredible product in Norvell that are truly the best solutions on the market. Norvell tanning solutions do not use dyes resulting in spray tans that are very natural looking, and customized to your skin type so you won’t experience the orange discoloration that you may have experienced in the past from other sunless tanning products or spray tan solutions. Also our Norvell Solutions use a high grade DHA, which will give better and longer lasting results. 11. Is it ok to get a Luxury Spray Tan at night? Yes, you can get your Luxury Spray Tan at night or go to sleep shortly after your Spray Tan session. Some of the cosmetic bronzer may rub off on your sheets but will wash out with the possible exception of very few fabrics such as wool, silk, spandex, and lyrca. We recommend you do not sleep on any of these types of fabrics within 8-10 hours of your session to be safe. 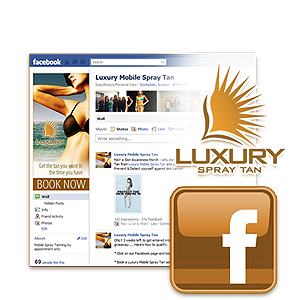 We actually recommend our Luxury Mobile Spray Tan service at any time of day. 12. Will a Luxury Spray Tan protect me from the sun? No, there is NO SPF or protection from your Luxury Spray Tan.